Transport has been shown to cause many indicators of stress, including increased heart rate, a rise in body temperature, lowered immunity to illness and disease, changes in hormone levels that are known to affect pregnancies, weight loss, increased instances of aggression and stereotypic behaviors. Inadequate animal care practices and space limitations make it impossible for animals to express normal behavior. This leads to a high number of stereotypies and other abnormal behaviors, increased aggression towards other animals, increased susceptibility to disease, the presence of physiological indicators of stress, and greater mortality. Isolation or separation from companions leads to complex changes in behavior, including a decreased interest in surroundings, stereotypies, increased heart rate, increased vocalizations and higher levels of physiological stress. Animals forced to live in close proximity with one another show a greater frequency of fighting and competitive behaviors and greater incidences of stereotypies. When different species are mixed or forced to live in close proximity to one another they exhibit a range of avoidance behaviors and increases in heart rate and other indicators of physiological stress and spend more time being alert. When predators are in close proximity to prey, the prey shows anxiety behaviors, changes in their nervous systems, a suppression of feeding and grooming behaviors and often a lowered breeding success. When they do breed, the presence of a predator’s odor can lead to smaller litter sizes and can hinder the normal development of young. Living space is necessarily limited to the back of a truck. Animals may have to share their trucks with circus equipment. Exercise enclosures, if erected, are frequently not made available to some or all of the animals due to time restrictions, not enough space, or competitive or aggressive animals. Animals are frequently transported to different parts of the country. Animals are left in their trailers for many hours longer than their journey. Animals are vulnerable to abuse by inadequately trained staff, who may be working under time pressure. The evidence discussed here supports the conclusions of the empirical evidence collected by ADI, and concurs with an earlier study of the effect of traveling and performing in circus animals, where abnormal behavior was observed in all species studied, indicative of poor welfare, environmental conditions and animal care (Kiley-Worthington, 1989). 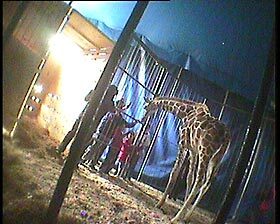 ADI’s studies of the use of animals in traveling circuses conclude that, given the circumstances, it is simply not possible for traveling circuses to provide animals with the space and environment they need to maintain optimum physical and psychological health.